It’s the scene from Dr. No that made cinema history: like Boticelli’s Venus, Ursula Andress, as Honey Ryder, emerges from the sea. Clad in a Bikini that was a sensation at the time, with a knife strapped to her tigh and singing ‘Underneath the Mango Tree’. A sight and sound that makes James Bond do something that he’s never done ever since in the subsequent 22 Bond movies: he makes his presence known by singing. But was it really Ursula Andress who sang? The Swiss born actress – like many actresses of her time – was purely cast for her looks. Even though she spoke fluent English, her heavy Swiss-German accent was a problem, which was to be solved by a then common method: she was re-dubbed by a voice actress, one that in her career would lend her voice to many Bond Girls: Nikki van der Zyl. Eunice Gayson as Sylvia Trench in both ‘Dr. No’ and ‘From Russia with Love’, Shirley Eaton as Jill Masterson in ‘Goldfinger’, Claudine Auger as Domino Derval in ‘Thunderball’ are just a few examples. Her voice could be heard in no less than ten Bond movies, without ever getting proper credit and not much recognition for it, as revoicing may have been a common method at the time, but movie producers always preferred to keep the use of this trick a secret. 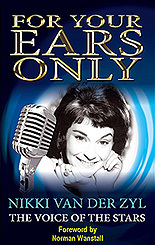 In her autobiography ‘For Your Ears Only’, Nikki van der Zyl now tells the fascinating story of her life. The book begins as Nikki flees Nazi Germany as a child to start a new life in England, and goes on to describe the many twists and turns in her professional and personal life. She describes the traumatic years in the High Court, fighting to keep her children from being taken from her after the divorce from her first husband. It would prompt a new career as a barrister and lead to her assisting the High Court Judge in the infamous Baader-Meinhof terrorist case. After a stint as political assistant to MPs in the House of Commons she worked in the Press Gallery reporting for a TV company, and later became an accredited lobby correspondent with regular access to no. 10 Downing Street. Nikki van der Zyl will present her book with a signing and Q&A session at The Cinema Museum, The Master’s House, 2 Dugard Way (off Renfrew Road), Kennington, London SE11 4TH on Monday, January 14th, 7pm to 9 pm. The book contains a foreword by Goldfinger’s Oscar winning sound editor Norman Wanstall and is available as paperback, ebook and Limited Edition hardcover. 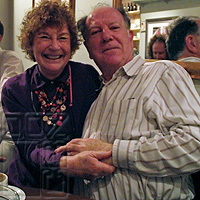 Further information at www.nikkivanderzyl.co.uk.